Snow on Slocum Street... I popped into a few stores last week with my camera, including JAN SHOWERS' showroom, which is of course done up glamorously for the holidays. I love this ARC DE TRIOMPHE ornament, the VINTAGE MERCURY GLASS bulbs, and all the snowy flocking on her tree. Ron Schultz does all of Jan's floral design, and I really love how he took white roses and made them more holiday with simple sprigs of pine. ...and these flirty WHITE FEATHER WREATHS tied with blue satin bows were hung in the windows and mirrors. 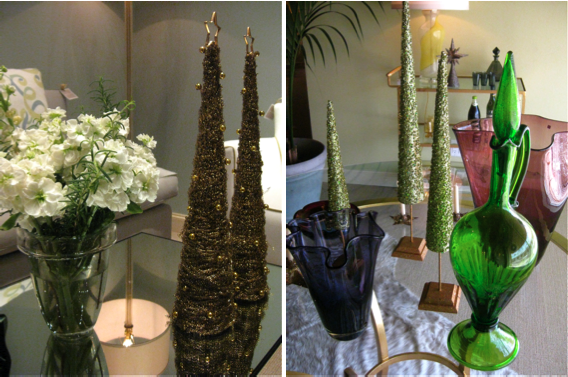 At Vintage Living/Lisa Luby Ryan, the entire store is filled with MERCURY GLASS trees, vintage ornaments, delicately blown glass, and rustic woods. Everything sparkles and really gets you in the mood for Christmas. I love the tall white pine cone candles and the glitter reindeer look like ones I had when I was growing up. I'm enchanted by this glass bird votive holder. It's also one of the best DESIGN IDEAS around at $29 because you can use it all year. There are two other bird styles in addition to this one, and they look great grouped together on a table. These mercury glass candy canes can go on your tree or make charming place card holders. 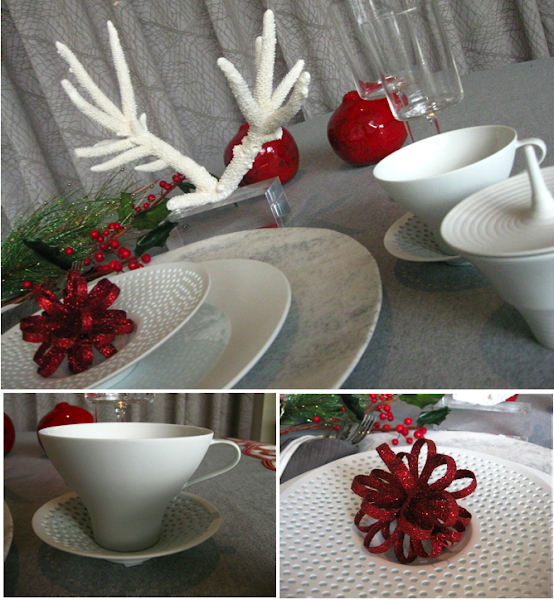 At DAVID SUTHERLAND SHOWROOM, Vicki Crew and Susan Smith of URBAN INTERIORS pulled together this witty tablescape for the holidays, using HERING BERLIN's stunning pierced and matt bisque porcelains. In lieu of a cloth, they've draped the table with a length of HOLLAND AND SHERRY's embroidered textile. The amazing marble charger is by DAVID SUTHERLAND and the modern glassware are CRATE & BARREL. These white CORAL branches mounted on LUCITE look just like reindeer antlers, don't they? Happy Holidays!